First Manassas Battlefield Troop Movements. refer to the numbers on this map. 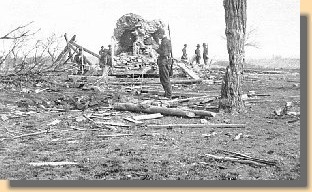 Early on the morning of July 21, two divisions of the Union army, under Colonel David Hunter and Colonel Samuel P. Heintzelman respectively, marched southwest on the Warrenton Turnpike and then turned north at Cub Run, near Centreville, heading toward Sudley Springs Ford (1) in order to outflank the Confederate left. To hide the attack and keep the Confederate left flank distracted, diversionary attacks were ordered against the Confederates at the Stone Bridge (2) (where the Warrenton Turnpike crosses Bull Run), Mitchell's Ford and Blackburn's Ford (These Bull Run fords are downstream and not shown on the map). The flanking march began at 2:00 a.m. The diversionary attacks began between 5:30 and 6:00 a.m. The early morning darkness and the condition of the roads delayed the Union troops flanking the Confederate left by way of Sudley Springs Ford. Meanwhile, on the Confederate left, at the Stone Bridge, (3) Confederate Colonel Nathan Evans was warned by semaphore that he was being flanked. Concluding that the attack in his front was just a diversion, he left a small force at the bridge, and rushed the remainder of his command to Matthews Hill, (4) arriving in time to confront the lead units of Col. Hunter's division. However, Col. Evans's force was way too small to hold back Union troops for very long. Coming to the assistance of Col. Evans, (5) the brigades of General Barnard Bee and Col. Francis Bartow made the fight more equal but were still not enough to stop the Union army when Col. Heintzelman's Division, which was following Col. Hunter, joined the battle. Shortly, the Confederate line collapsed and the men retreated, (6) in disorder, to Henry Hill. 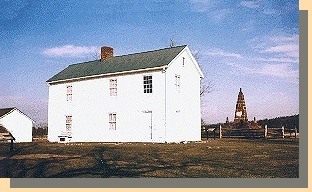 The ruins of Henry House after Manassas 1, and the reconstructed house in 1998. Judith Henry refused to leave the house and thus became the only civilian casualty of the battle. She is buried in a plot in the front of the house. The monument in the back is dedicated by the Union to the "Patriots" of the war (See below). Dedication (1865) of a monument to the Union soldiers who died at 1st Bull Run.